The holidays would not be complete without green bean casserole. When we first went dairy and gluten free we went many years without this holiday staple. Then I learned to make a roux and I started making this casserole again without the French Fried Onions. And then, ALDI started making gluten free french fried onions and holidays dinner was complete! Personally I like it if the green beans are still a little crunchy so I use fresh beans. Using can or frozen beans is fine too. The other ingredient that can be changed around is the onions. I like using dried chopped onions, the ones you get in the spice isle. These make me think more of the dried onion soup mix that I used before we started our gallery journey. Slowly whisk in chicken broth followed by the rice milk. Whisk until thickened. Season with salt and pepper, and add 1 tablespoon of lemon juice. In a saute pan heat a few tablespoons of olive oil and add mushrooms and stir occasionally until mushrooms are softened. Add the garlic to the mushrooms and heat for just one minute more. 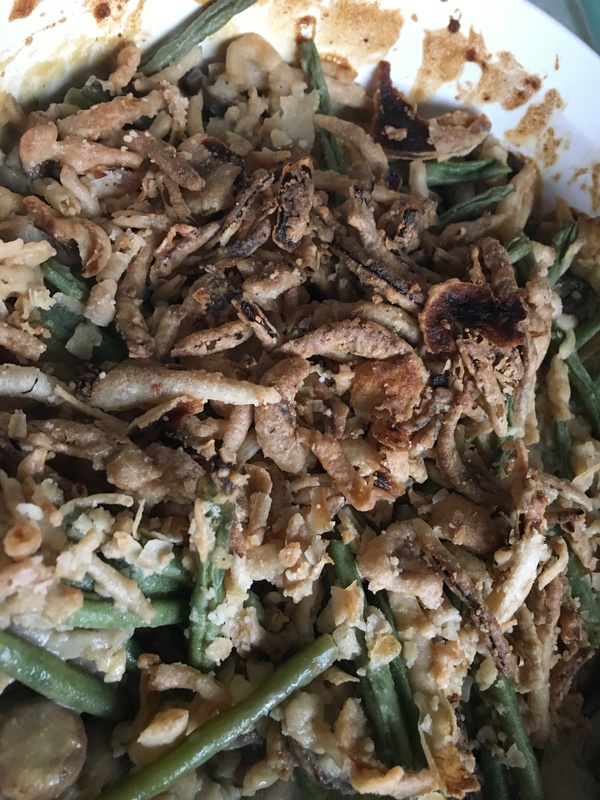 In a casserole dish combine green beans, roux, mushrooms, chopped onions, nutritional yeast, a whole can of french fried onions, and season with salt and pepper. Cook at 350 for 20 minutes. Take out casserole and stir. Top the casserole with some more french fried onions and cook for 10 more minutes.